Keno is a popular that can be enjoyed over a beer at the pub, or by making a quick pick on a trip to the newsagency, chemist, service station or lotto outlet. Now, thanks to the growth of online gambling, keno can be played for real money on the Internet, giving punters the chance to have a bit of fun while playing for cash rewards from the comfort and convenience of home. Read on to find out how and where to play online keno, and why you should consider making the switch. 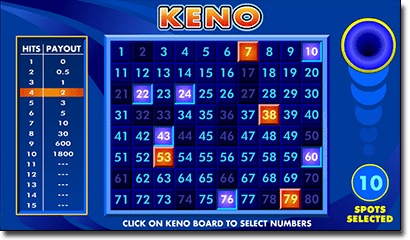 Online keno follows the same format as land-based keno, with a few notable differences. 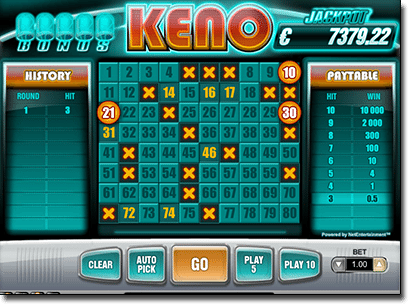 First and foremost, keno is a game of chance relying purely on luck, making it ideal for newbies and seasoned players alike. While you may come across some recommended keno strategies, it’s important to remember there is nothing a player can do to influence the outcome of a keno game and it should be played as the fun, luck-based game it was intended to be. The standard game of internet keno is made up of a board with the numbers one to 80. Players have the choice of picking as little as one or as many as 20 numbers, depending on the game at hand. The difference in Web-based games is that instead of marking your picks on a keno card and waiting five minutes for the next draw, you just use your mouse to select your picks and then hit the play button at any time. The amount you win in online keno depends on how many lucky numbers you picked and how many of those numbers won, with wins based on how much you bet on the game. The paytable in each digital keno title is different, but will be clearly displayed on the side of the keno board. To play keno online for real money bets, you need to create an account with a reputable online casino and make a deposit to fund your casino bankroll. Below are the top-rated casino sites which accept international players. Click any of the links in the table above (geo-targeted to your location so it only displays the best casino sites legally catering to players from your country) to sign up for an account and you’ll receive some great welcome bonuses that are exclusive to readers of Real Money Casinos. Each of these casinos is available in instant-play mode, so you can play keno directly over your Web browser without having to download any additional software. Once you’ve registered, head to the casino banking section to make a safe deposit using a trusted payment method like Visa, MasterCard, Neteller, Skrill, Paysafecard or bank deposit. A majority of deposit options support instant transfers, so you can start playing real money keno online as soon as you confirm the transaction. The easiest way to find a keno game is to use the casino’s search function. Some of our recommended casinos only offer a single version, while others carry several variants. Once you have loaded the keno game of your choice, select your desired bet amount, click to select between one and 20 lucky numbers and hit the play button once everything is in place. For even quicker gameplay, select the ‘auto-pick’ option to have your keno picks selected on your behalf. The computer will then automatically make random, unbiased picks, marking any of your winning numbers and automatically crediting any wins direct to your casino account. You can then choose to clear the board and pick another round of lucky numbers, or play the same numbers again. Not sure if online keno is right for you? You can play for free in practice mode at our recommended keno sites to get a feel for online play before deciding whether to commit to a real wager. Online keno games are available 24/7 and begin with the click of your mouse, so no need to wait around for the next draw. You don’t need to remember to make your keno picks when you’re passing by a lotto outlet, or return to the retail location to receive your winnings, with everything done from the convenience of your computer. Signing up for an online casino account gives you all kinds of bonuses you won’t get when playing pub keno, including free spins, matched deposit bonuses, loyalty points and access to exclusive online casino promotions. You can pre-buy up to 10 keno tickets using the same numbers at once when playing online, allowing a much faster-paced game – but be mindful this is a quick way to chew through your bankroll. There’s no chance you can lose your winning keno ticket, with online winnings processed to your account on the spot. The downside to online keno is the jackpot prizes aren’t usually as lucrative as land-based keno, but if you shop around you can find real cash keno games that offer some huge rewards. There is no set house edge for online keno games, but as a general rule the house edge is much more favourable to the online player given the lower operational costs and higher competition between online vendors. Standard video keno games carry a RTP (return to player) of 90%, compared to pub keno which may carry a RTP as low as between 70% and 80%. This NetEnt keno game, which can be found at Guts.com, carries a payout percentage of 94.2%. With paytables not advertised for online games, the only way to know if a keno game ticks all the right boxes for you is to play around and find out first hand. When deciding to play for real money, remember to register using our links to claim some exclusive welcome bonuses to help kick start your online keno experience.